Actions, not words, convince people. Ideas can illuminate, but it is examples that attract and move us. Examples are understood by everyone. Most explanations tend to confuse more than clarify. Actions speak for themselves. What has marked the new Pope Francis, the one «who comes from the end of the world», namely, from outside the European frame of reference, so charged with traditions, palaces, royal spectacles and internal power struggles, are the simple, popular gestures, obvious to those who appreciate a good common sense of life. Pope Francis is breaking protocols and showing that power is always a mask and theater, as sociologist Peter Berger pointed out so well, even when the power purports to be of divine origin. Pope Francis simply obeys the command of Jesus of Nazareth who explicitly said that the great of this world give orders and dominate, “but it shall not be so among you: but whosoever will be great among you, shall be your minister: And whosoever of you will be the chiefest, shall be servant of all. For even the Son of Man came not to be ministered unto, but to minister" (Mark,10,43-45). Very well, if Jesus said that, how can the Pope, guarantor of His message, act otherwise? Certainly with the establishment of the absolutist monarchy of the popes, especially beginning with the second millennium, the ecclesiastic institution inherited the symbols of Roman imperial power and of the feudal nobility: colorful clothing (such as the Cardinals'), tinsel, crucifixes and rings of silver and gold and palatial habits. In the great religious convents of the Middle Ages, life occurred in regal spaces. In the room where I stayed, as a student, in the Franciscan Convent of Munich, that dates back to the times of William of Ockham (XIV century), one Renaissance painting on the wall was itself worth several thousand Euros. How can one reconcile the poverty of the Nazarene, who did not have a corner where to rest his head, with the miters, golden bishop's staffs and the stoles and prince-like vestments of present day prelates? That is honestly not possible. And people who are not ignorant, but fine observers, notice the contradiction. All this ostentation has nothing to do with the Tradition of Jesus of Nazareth and His Apostles. According to some newspaper accounts, when the Secretary of the Conclave tried to place on the shoulders of Pope Francis the «muceta», the little richly adorned cape, the symbol of papal power, Francis only said: “The carnival is over, put those clothes away". And he appeared dressed in white, as did Dom Helder Camara, who left the colonial palace of Olinda and went to live under a humble roof in the Church of Las Candelas, in the periphery; as Cardinal Dom Paulo Evaristo Arns had done, not to mention Dom Pedro Casaldaliga, who lives in a poor little house, sharing the room with a guest. 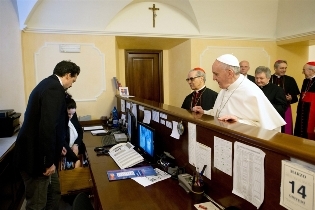 To me, the most simple, honest and common gesture of Pope Francis was when he went to the hotel where he had stayed (he never stayed in the big central house of the Jesuits in Rome) to pay his bill of 90 Euros per day. Pope Francis walked in, and he personally gathered his clothes, packed his suitcase, greeted the staff of the hotel, and left. What civil potentate, opulent millionaire, what famous artist would do such thing? It would be a betrayal of the intent of the Bishop of Rome not to see in this gesture, so normal for all mortals, a populist intent. Did he not do the same when he was the Cardinal of Buenos Aires and went to get the newspaper, went shopping, used the metro or the bus and preferred to introduce himself as, «father Bergoglio»? Frei Betto coined an expression that is a great truth: «the head thinks from where the feet step». In effect, someone who always walks in palaces and sumptuous cathedrals, ends up thinking according to the logic of the palaces and cathedrals. For this reason, Pope Francis celebrated Sunday Mass in the Chapel of Saint Anne, inside the Vatican, considered the Roman parish of the Pope. And after Mass he went outside to greet the faithful. It is worthy of note, and charged of theological content, that he did not present himself as the Pope, but as «the bishop of Rome». He asked for prayers not for the Emeritus Pope, Benedict XVI, but for the Emeritus Bishop of Rome, Joseph Ratzinger. With this Francis retook the most primordial tradition of the Church, that of considering the Bishop of Rome «first among equals». Because Peter and Paul were buried there, Rome acquired special preeminence. But that symbolic and spiritual power was exercised in the style of charity, and not as juridical power over the other Churches, as occurred in the second millennium. I will not be at all surprised if, as John Paul I had wanted, Francis decided to leave the Vatican and go live in a simpler place, with a great exterior space to receive the visits of the faithful. The time is ripe for this type of revolution in papal customs. And what a challenge is presented for the other prelates of the Church to live in voluntary simplicity and shared sobriety.